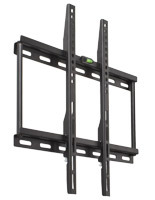 These fixed TV mounts are made with dual extending arms for walls. 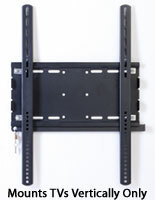 Our brackets are designed for those who wish to display a large format plasma or LCD TV close to the wall. 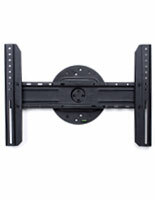 A stationary flat screen monitor mount may be affixed at any height in a room. At this level, a TV can be viewed from everywhere in a room. 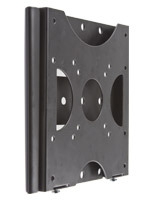 You commonly see these universal TV fixtures mounted on the walls of airports, hotels, conference centers, sports arenas and concourses, retail associations, schools, and even homes. The multi-purpose brackets have a variety of features that make them good choices for those with little space or who just don't want a large piece of furniture holding their TV. What should you look for in a flat screen monitor bracket? Durability. 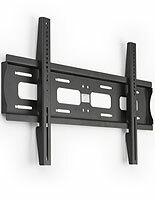 The fixed TV mount is constructed of strong steel to ensure they will last through many years of continuous use. Positionability. The vertical supports slide left and right, a critical benefit that allows you to position the LED TV in just the right place. Stability. 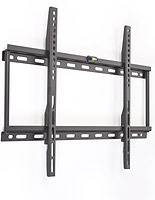 When properly installed, they provide a stable base on which to display your flat screen LCD TV. The steel hooks simply hang onto the horizontal sections. Invisibility. Their low-profile design, with some models less than 1" thick, allow for displaying your TV as close to the wall as possible. Why select a universal VESA compatible LED wall mount? VESA stands for the Video Electronics Standards Association. 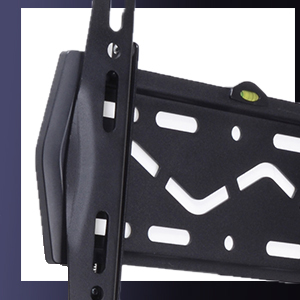 VESA brackets were engineered after conferences between hardware and TV manufacturers resulted in TV manufacturers agreeing to follow certain specifications when designing how their TVs affix to the brackets. Prior to these specifications, buying a monitor mount was hit or miss. Today, you simply match the VESA numbers of both TV and bracket, and you know your flat panel LCD or plasma TV is compatible. That means whether you have an LG, Sony, Vizio, Panasonic, Toshiba, or other brand television or monitor it will fit onto these standardized fixtures. VESA has removed the guesswork. These fixed displays lay flush against walls and allow no movement of the flat screen TV. One step up from this standard style is a model that sits a little farther out but allows the TV to be angled downward, making it easier to view. An additional benefit combines tilting, as described previously, and panning that allows the TV to be moved from side to side. This gives even greater flexibility in how the TV may be angled in a room to provide maximum viewing ability. 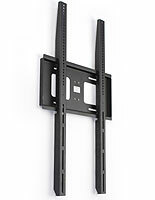 A further enhancement is the inclusion of an articulating arm that extends a distinct distance from your walls and boosts the panning abilities of the TV. These optimal monitor floor stands give maximum flexibility in viewing angles. Of course, the mounts you select are dependent on the rooms in which the TVs will be displayed. Smaller rooms do not require tilting or panning abilities. Large rooms may require the maximum tilting and panning abilities.